One of my fathers prized posessions was his 1968 Chevy Corvette. It was a pearl white classic muscle car, that he was proud of. It overloaded your senses when whisking you down the road, and was an experience to be had for sure. It was my fathers pride, one more thing to prove he can build anything with the best of anybody. Around the time I was 30 my father came to pass unexpectedly and quite unfortunately. This left everythng behind in an unfinished state, including the Corvette. It had sat neglected for the better part of a decade in our barn. A plethora of squirrels and mice had move in and out of it. The corvette existed in an inbetween state where the engine wasn't configured nor running right, and no one exactly knew what was in it. It barely ran, and had seen far better days. It was for sure a project. Inheriting the Corvette caused a bit of controversey in my family. We'd all lived under the image of my father as a genius at anything he set his mind too. The corvette in theory was his pinacle. A classic muscle car with a fire breathing engine requiring leaded race gas to go... it surely was worth 50,000 dollars many swore. Except it wasn't, and my father wasn't all the genius we'd thought. He was just an avid tinkerer. The car was a raging disaster, and no one knew it. The Corvette was purchased by my father in the early 80's damaged quite severely. My father pulled the original engine, and replaced the frame. The Corvette instantly plummetted in value, no longer being a numbers matching original. It no longer had value as an antique to the majority of purchasers. Then, the new engine that was built had none of the critical information to back up it's claims. No dyno information, no build information, nothing. Hell the business name isn't even around. Next up, the corvette was assembled to completion by my tinkering father. Used carboraters, hoses, random belts, other assorted short cuts... the corvette was in a cobbled together and rough shape by the time my father finished it in the mid 80's, and then it sat mostly unused for the next 30 years. When it came to me, it wouldn't idle, it barely ran, it was doggy, it had a giant bog off the line, it rattled and shook at high speeds... and the brakes nearly pulled the car off the road due to what I would later discover was mismatched front hubs and spindles. My dad rarely drove it because it was "such a monster"... but that wasn't the case. It was scary as all hell and barely held together. 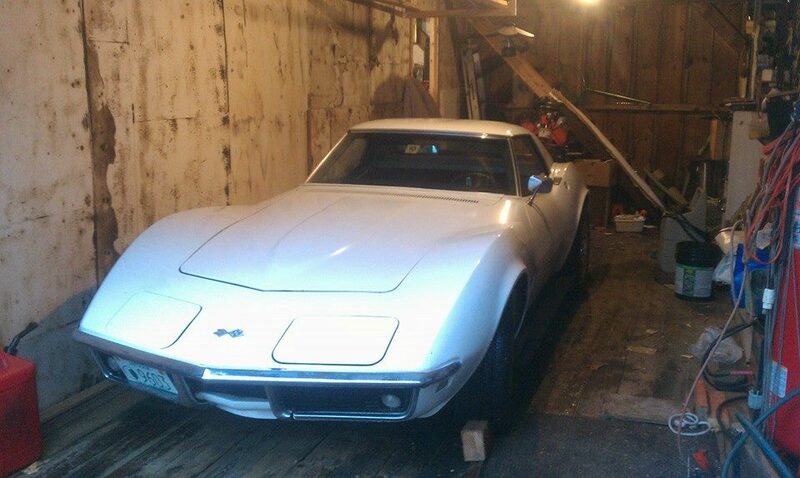 This is the story of taking my fathers project from the state I received it in to a better state. It will become a family heirloom. As bad as the state I received it in is, the Corvette came into our family completely destroyed. My father made many steps forward, and a few back along the way. This will be an ongoing document of the steps forward I make with it in my possession.